In the youth area, the singers in the Cor Jove and the Cor de Noies receive singing classes from a team of teachers who, in coordination with the choir directors, work to ensure a level of vocal excellence both at individual level and in the choir as a whole. At the children's stage it is the director of the choir himself who teaches singing concepts to small groups during partial rehearsals. These work exclusively on the voice, and pupils who wish to learn an instrument must do so outside the Escola. The singing teachers for the Cor Jove are Anna Ollet, David Hernández, Esteve Gascón and Elisenda Arquimbau. Ulrike Haller and Oriol Rosés are the singing teacher for the Cor de Noies. As well as singing in the choirs, the choristers receive specific training in musical language, with the primary aim of working on sight reading and ensuring fluent reading to enable them to approach the repertoires performed by the choirs. 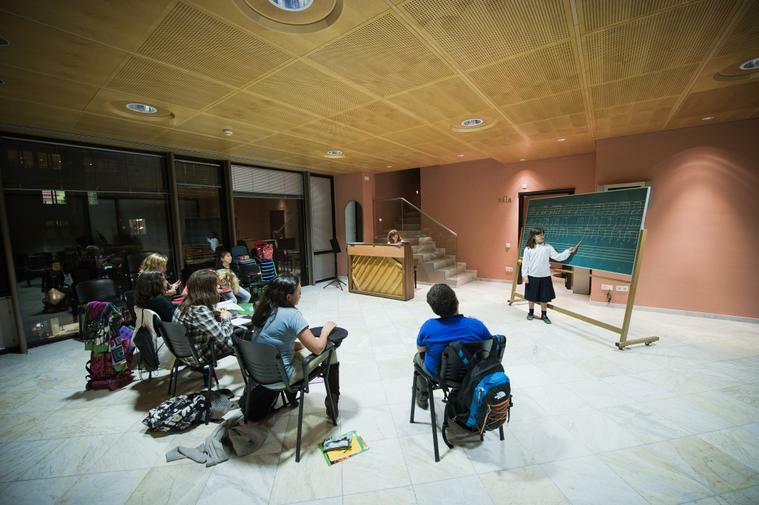 In the first two years, in the Cor Petits of the Orfeó Català, musical language is learnt together with choir rehearsal, and from the Cor Mitjans inwards singers receive specific classes in musical language. The Escola Coral consists of 8 levels of musical language which are studied during the childhood stage. The teachers of musical language at the Escola Coral are Glòria Fernández, Mercè Pi, Laia Armengol and Edwin Garcia.